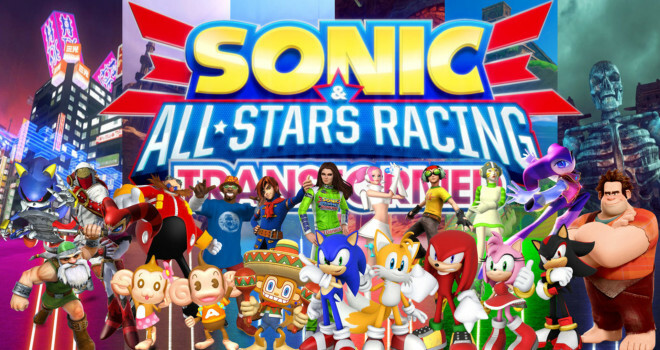 Sonic and All-Stars Racing Transformed, the sequel to Sonic and Sega All-Stars Racing, takes the great qualities of that game, and makes it even better. This time, with the new gimmicks implemented (flying, speed boating, and driving), the replay value is tremendously high, and really justifies the reason Sonic is in a car in the first place, besides the fact that he’d win every single race if he was on foot. This game even gives the Mario Kart series a run for its money…Yes, it’s that good! But as far as greatness goes, this game excels in the console version, especially on the PC. Unfortunately, I’m not reviewing that version, I’m reviewing the handheld “port” of SASRT on the Nintendo 3DS. As of today, the 3DS version has gotten fairly lower reviews, and for good reason. The gameplay is the game’s lowest point, but before I get to that, let’s look at the other aspects first, and see if this game is really worth the money. First thing I noticed while turning on this game, is that the soundtracks are straight from the consoles, and the game is made to emulate that in every way. The sound and music sounds great for the most part, and like all handhelds, if you want to get the most out of the bass and treble, just pop some headphones and enjoy. But the problem is that the music sounds like it’s been compressed to fit in the 3DS, therefore it sounds a bit low in quality at times. If you’ve never played the console version, you won’t notice it, but if you have, then you’ll realize the slight drop in sound quality. This doesn’t ruin the whole music though; maybe it’s just an issue with porting from HD to handheld. Another issue I found was the most bizarre. There are sound controls for you to adjust the music, SFX, and the voice announcer. But no matter how low you turn everything down, there are times when you’re playing and you grab an item, then the sound glitches and bursts out very loud for a split second. This is very random at times and really aggravating when you’re playing the game in a quiet area or library. If you happen to be playing this game in any of those places, do yourself a favor and turn the volume completely off, or wear headphones. Since this is the handheld version of its HD counterpart, I will not judge it unfairly by comparing them both. I will be reviewing the 3DS graphics on its own merit. And quite frankly, it looks pretty amazing. That was the second thing I noticed after the sound. The handheld tries its very best to emulate the consoles, and pushes the capabilities of the Nintendo 3DS, making this look even better than Mario Kart 7. MK7 looks as good as Mario Kart Wii, and that’s not really saying much since there’s nothing super spectacular about Super Mario graphics. I also loved the textured look of the Egg Hangar, to the urban feel of Graffiti city, to the beautiful splendor of Sanctuary Falls (which looks exactly like Sky Sanctuary in Sonic Generations). And when you’re going fast, it actually looks like it, and you feel it too. Whereas in MK7, you feel kind of slow and sluggish, if you’re not using any boosts or speed items. Mind you, this game’s graphics are nowhere near the high standards of a game like Resident Evil: Revelations. To this day, I still haven’t seen a 3DS title whose graphics surpass the one in Resident Evil. But for a go-kart racer game, SASRT is definitely not bad looking. Now this is where most of the problems lie. It took me quite a while to fully understand the controls of SASRT 3DS a lot longer than MK7 that’s for sure. When I did, it was fun, and I enjoyed it even more. The problems arose when the game started glitching on me a lot. During the game, there are some blue hoops that transform your vehicle into a plane, car, or boat as you’re racing throughout the course. This is when the game is most interesting, and this where most of the glitches happen. Since the gameplay style changes with the different vehicles, the glitches can be very annoying. Many times when I’m using my All-Star move and go through the transform hoop, I either glitch through the water and fall to my death, or glitch through a wall and veer so far off the course that I end up dying and getting pushed all the way back. Sometimes when I’m flying and run into a wall, I get stuck there, and can’t get out, which makes me lose an entire race. More than once I had to restart the whole course because I was simply stuck, or repeatedly kept dying over and over at the same spot! Nobody likes to restart a race, nor should anybody have to do that. Over the past month I’ve played this game, I’ve noticed that most of the glitches come from the All-Star move, and it’s very hard to control your vehicle when you’re in that state. Your car hovers above the ground as you temporarily are flying, and hurling attacks at your opponents to get in the lead. Since this game was released 3 months after the console version, I wonder why the developers did not fix this. It’s not only you that glitches, but the other AI players that can glitch with you too. There’s a section on Burning Depths where everyone, including you, glitches through the transform hoop, which causes everyone not to transform into cars. I didn’t know whether to laugh, or rage to see everyone slipping and sliding across the road at turtle speed, and not making any progress. Another issue is that sometimes when your car hits a wall, it may overturn and tumble which causes the camera to lose focus and jerk around to keep up with you. I don’t think the developers of this game intended for there to be any crash animations in the first place. Also, drifting can be a bit of a hassle in this version, and you’re constantly hitting the edges, no matter how good you drift. You’re forced to actually slow down and use your brakes when turning tight corners, to avoid running into something and losing the race.